We are entering the age of decluttering! From minimalism to capsule wardrobes, from project 333 to KonMari – there are many efficient and inspiring tidying approaches out there. But which one to choose? Picking the approach that’s right for you and finding your way through the decluttering jungle can seem overwhelming. 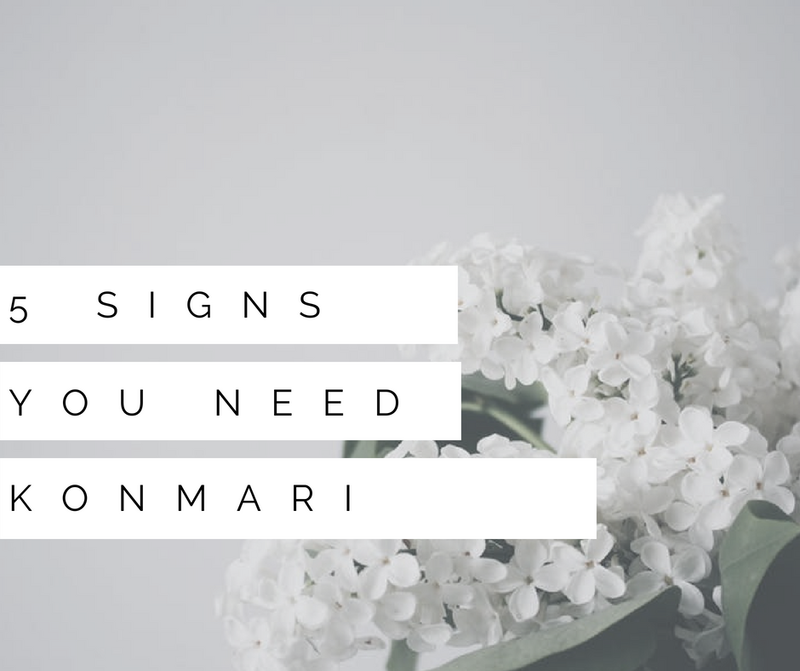 Find out if you’re a KonMari person by checking out these 5 Signs You Need KonMari in Your Life! You’re already late to an important appointment but can’t seem to find that one thing you need – where did you put it last time, where could it be? While searching through your drawers, you become more and more agitated and ask yourself why oh why you cannot keep your place organized. Sounds familiar? The good news is, you can eliminate this situation once and for all! In the KonMari Method, every item has a designated space. Once you have used the item, whether is be kitchen utensils, a scarf, a book, it will be put right back into this designated space. Smart organization solutions such as boxes, drawer dividers, jars and others will help to find the perfect way of storing the items. Another important element is to store all items in a way that they are visible; no item is hidden behind the others. This way, it is very easy to spot each of your belongings right away and put them back without “disrupting” the order. No more searching for items – you will know right away where to find everything, making your daily life a lot easier and saving yourself valuable brain space! Are you turning the light off and go into hiding when the doorbell rings or unexpected guests show up in front of your door? Maybe that’s because your space is a mess. Fact is, you are missing out on fun activities, such as having friends over for dinner, hosting a cocktail party at your place or simply welcome unexpected guests into your home. All these activities nourish your social life and can do wonders for your life balance. By removing all clutter from your space and choosing a designated spot for each of your items, you are creating a clutter-free space in which you can breathe. Nothing is just lying around, because everything is used and everything has a place. You will not have to think and wonder where everything goes – tidying will be automatic and take you merely a few minutes in a fully KonMari’d space. Your space will look tidy and beautiful all year round and will quickly turn into your friends’ and family’s favorite place to hang out. When was the last time you lived one of your dreams? When was the last time you took some time only to follow one of your passions? If you can’t remember or the last time was way too long ago, it is time to make a change, more precisely: to make room! One of the most interesting “side effects” of applying the KonMari Method to your life is that people have more time and room to make positive “magical” changes in their lives. While you spent too much time making your way through the clutter, constantly tidying and moving stuff around, after KonMari, all this time can be used for activities you truly enjoy! There is also a psychological factor to it – a decluttered and organized space makes you feel light, free and energized; the best conditions to take on new adventures and hobbies. Discard what no longer serves you and start living your ideal life without the clutter-baggage! Your wallet is empty and your closet is overflowing with useless stuff? Your kitchen cabinets and drawers are so cluttered that you are tempted to just keep ordering take-out for the rest of your life? Then you are one of the many people who keep accumulating objects although they really don’t need them. One of the reasons for this is because we don’t really know anymore how much we have of everything: can you say (without looking into your closet) how many pairs of jeans you own? Very often we simply forget about those items in the backs of our drawers. Chances are, if you are not aware that you already have enough of an item, you are running into the risk of buying more and more, which leads to unnecessary spending. Buying stuff can make us feel satisfied temporarily, but the joy is short-lived. Material things that we buy out of impulse can never fill the emptiness many people feel inside. Instead, our lives should be filled with things that truly spark joy, especially our passions and dreams. The idea of the KonMari Method is to only surround yourself with things you love. Needless to say, being surrounded by things that spark joy every day, your mood will improve significantly, contributing to an overall more positive and happy life. The fact that the KonMari Method is based on focusing on the things you love (instead of the ones you decide to discard) makes it an easy and yet very effective approach to tame the clutter in a joyful way. Organizing your home the Konmari way simply has that Spark Joy Factor for yourself and others. In general, decluttering is a very good way to make room for positive changes in your life. And by living a life that sparks joy, you might even inspire other people around you! If you answered YES to one or more questions above, KonMari is the decluttering approach for you! No matter what approach you use, decluttering can be a truly liberating experience, tracing the way for tons of other positive changes in your life. The important thing is to start!